Christmas 1978: Monday Morning, 5 am. I’d like to tell you story. Like all good stories, it is possibly a little long winded, and feels a little irrelevant until you get to the point. This may or may not be a good story. I’d be curious to know your opinion. But bear with me. It was Christmas Day, 1978. A Monday. I was 9 years old. We were staying in Ballarat ( regional Victoria) with my Aunt for Christmas. As I mentioned, I was nine. :Christmas was exciting, even more so at five in the morning when you wake up with an exciting new form of seasonal insomnia. Monday morning at five o’clock is not a time that comes naturally to me these days, but on Christmas day as a child, it represented a definite sleep in! Our personal family record occurred in 1977, when my brother and I got up at 3:40am on Christmas day, ten minutes after our parents had gone to bed. He proudly went in to excitedly inform our visiting relatives that he had been given a bicycle, and it was all red! Oddly enough, our relatives did not share his enthusiasm at this time. The story however is presented on a semi annual basis to this day. But I digress. The labelling on my box was a little less French! But back to 1978. I had asked for a LEGO Technical set. I don’t recall being particularly fussed about which one. When I woke up early, I selected a box, and gave it a rattle. It wasn’t an especially big box, but it was all I was allowed to open before a civilised waking hour. This set was number 872: Two Gear Blocks. I had no idea what this set was intended to do. And I had to wait until a civilised hour before Dad would explain that it was to slow down the rate of rotation of a motor. This upset me a little, as the only motors I had belonged to a train set that I had received a year or two earlier. I cannot recall if it was the above Christmas, or another occasion. This one was a similarly sized box, that did not seem to rattle as much as the previous one. This set had only twenty-two pieces, and was #870 – the 4.5V Technical Motor. One of the best things about going away for a Family Christmas meant there was plenty of time for discussion, menu planning, basting, food preparation, cups of tea, cooking, pudding completion, meat roasting, and gravy making by parents, aunts, uncles, grandparents and extended family. By the time Christmas Lunch was ready, it was close to four o’clock in the afternoon. But I didn’t mind. I had completed the Helicopter. I enjoyed spinning the rotors with side mounted steering wheel. And the blades had variable pitch, with the aid a a lever in the cockpit. I don’t think I even noticed that Lunch was running a bit late. Who needs Christmas Dinner, when you can build a brand new LEGO® Technical Helicopter and demonstrate the maximum rotor pitch. Thank’s Dad for taking this picture, thanks to my daughter for unearthing it while visiting her Grandparents! By the end of the Christmas holiday, I had built the ‘B’ Model – a monoplane, with a propellor that spun as you pushed it along the ground, rebuilt and motorised the A model, and finally put together an unstoppable, motorised shunting vehicle that attempted to clear Granny’s finest china from the dining room table. After this I was invited to do some reading… Certainly I was hooked with building using my Technical Sets, which were undoubtably very ‘system brick’ oriented in its style. While I was delighted to receive the helicopter, the most coveted set that year was in fact the Technical Flagship Set: The 863 Car Chassis. With over 600 pieces, rack and pinion steering and a front mounted engine, this was the pinnacle of LEGO sets in this era. I never received that set and I am thankful for this. It was at least another 18 months before I received my next Technical set. That set was 8860: Another Car Chassis, with a rear mounted flat four engine, all the previous bells and whistles, a variable slip differential, a two speed gearbox and rear wheel suspension. This set was, by all accounts a great improvement over the previous version. I performed the standard 10 year old builder’s modification of increasing the gearbox to accommodate a third gear, and developing an understanding as to why the designers had decided not to include it in the first place! This set remained in the LEGO Catalogue up until 1987. An epic eight year run!. The next Technic Car Chassis did not appear until 1998’s 900 piece epic: 8865: Test Car. Over the years, these sets have evolved: losing the brick and plate construction that was par for the course at this time, to a beam and panel construction style. I am still coming to terms with the new vocabulary for working with these pieces. In 2016 we saw the release of the Technic Porsche 911 with 2704 pieces and a price tag to match. With 2017 representing the 40th year of LEGO Technic, a celebration of the 8860 is underway. 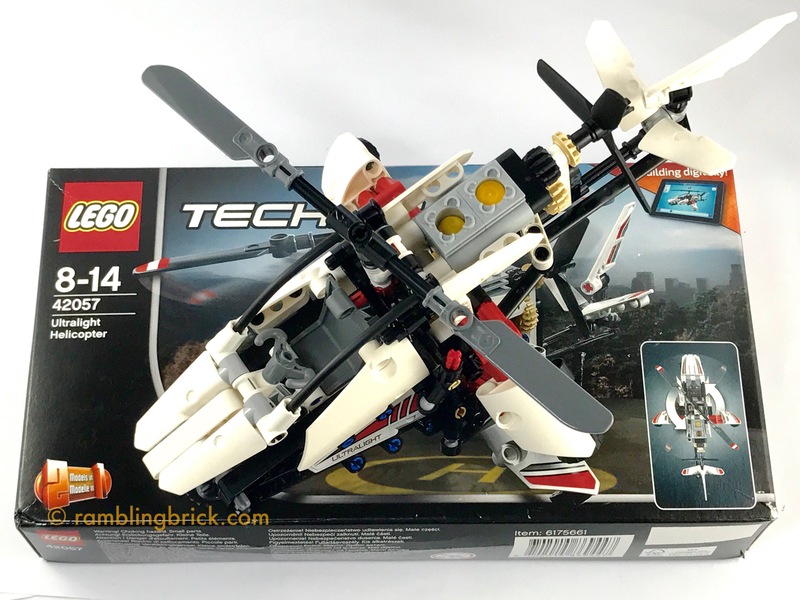 Using components from 42057 (Ultralight Helicopter); 42061 (Telehandler) and 42063 (BMW R 12 GS Adventure), you can revisit 8860, using contemporary Technic construction techniques. The construction style is quite different to that of the 1980’s – and the final model looks as if it will be a little smaller than the original 8860, but I took the first step back towards visiting Technic sets this week. The Ultralight Helicopter is a small, inexpensive Technic kit, with 200 pieces – around two thirds of the original helicopter I received all those years ago. It took around an hour to build. As an ultralight, the top rotors spin and drive the thrusting rotor, and the 2 cylinders in the engine move up and down as they do so. The pitch of the blades do not change, but there is a lever that allows you to turn the rudder.